To gain the SACE, students complete about two years of full-time study which many students spread over three years. Most students do in Year 11, apart from the Personal Learning Plan, which most students are likely to do in Year 10. Most students do in Year 12. Each subject or course successfully completed earns ‘credits’ towards the SACE. At least 200 credits are required for students to gain the certificate. Ten credits are equal to one semester, or two terms, of study in a subject, and 20 credits are equal to a full-year subject. Students will receive a grade from A to E (A+ to E- at Stage 2) for each Subject. 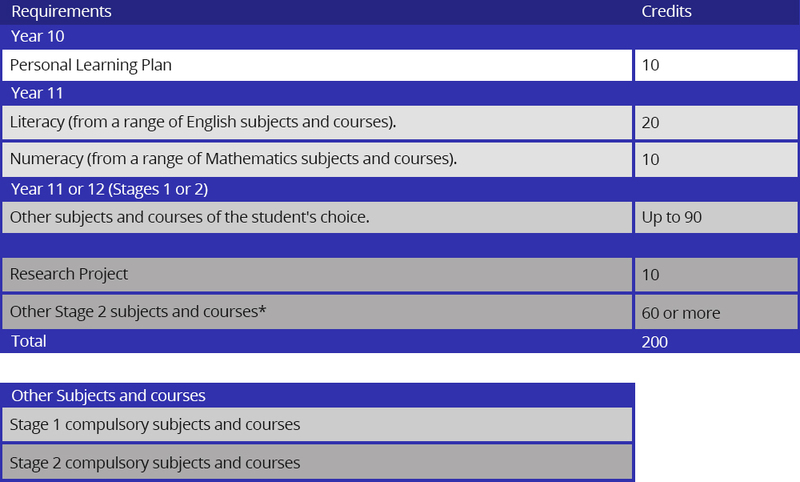 For Compulsory Subjects, they will need to achieve a C grade or better. Literacy – at least 20 credits from a range of English subjects (Stage 1). Numeracy – at least 10 credits from a range of Mathematics subjects (Stage 1). Research Project – an in-depth major project (10 credits at Stage 2). The remaining 90 credits can be gained through additional Stage 1 or Stage 2 subjects or Board recognised courses of a student’s choice. The Table below shows how the SACE fits together. *Most students will complete subjects worth more than 70 credits at Stage 2.